School Counselors Use the Play Therapy Mandala. Learn how to do it. I am a school counselor who is taking a play therapy class with Dr. Stangline. I love this play therapy technique and plan to use it in school counseling. Soon after the school counseling / play therapy mandala project was presented and explained to the class, I immediately had a visual of what I wanted to do. I initially wanted to create the mandala with rocks and intended this picture to be the “sketch” of what I would do later, but the more I thought about it, the more I gravitated toward the idea of the rocks really being “cells.” I wanted to capture the essence of looking through a microscope and being able to have a birds-eye (objective) view of the thing being examined. In this case, the thing being examined is my life. With a microscope, the viewer is able to see the cells of a body, and the cells usually have some sort of translucence or transparency. Thus, rocks (being opaque) wouldn’t work, so I worked with my sketch and refined it. The black cells represent all the things that exist in my reality that are negative, that I am unaware of, or that are unknown. The size of the black cells is larger, representing the size of issues (large) and difficulty or inability in handling and managing them. The gray cells represent uncertainty and ambiguity, also doubt. These cells are smaller than the black ones, but they also outnumber the black cells. The yellow cells represent the things in my reality that are certain, manageable, and positive. The yellow cells are indeed smaller, but they are numerous. The cells are slowly filtering down in a southeasterly direction. Slowly but surely, the black cells change and evolve into smaller, gray cells, which eventually become smaller yellow cells. 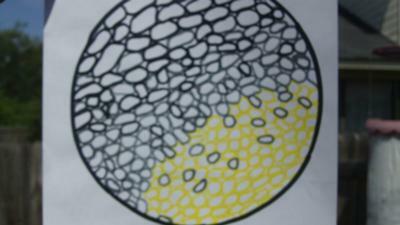 The vast majority of the cells go through this process, but at times some gray or black cells don’t make this transformation, hence the presence of some gray cells within the yellow layer. The color layers aren’t meant to be distinct (there are gray cells in the black layer as well), but they generally and naturally do exist. I suppose the layers could also represent unconsciousness (black), subconsciousness (gray), and consciousness/awareness (yellow). The one who is currently able to look through this microscope and observe this view. However, I think if I am able to achieve self-actualization across all life realms, I also would be able to gain this objective perspective of my own life.